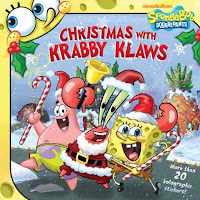 Christmas with Krabby Klaws is about 15 pages long and includes over 20 holographic stickers that match the theme of the book. Under the sea, in the land of Bikini Bottom, Spongebob and his boss at the Krusty Krab named Mr. Krabs are hosting a winter wonderland party for all the plankton and fish children. Mr. Krabs is posing as Santa Claus, and comments to Spongebob on his popularity and riches earned from hosting the gala, which he suspects have begun to supersede that of Santa Claus. Shocked by Mr. Krabs' selfish statement, Spongebob convinces Mr. Krabs that he must perform good deeds to be placed back onto Santa Claus' "nice list." By the end of the story, Mr's Krabs is in good holiday cheer and all ends well within the land of Bikini Bottom. Each page of Christmas with Krabby Klaws is full of lively, bright illustrations that mirror the Nickelodeon cartoon perfectly and add to the overall humor of the book. Parents and guardians who read Christmas with Krabby Klaws to their children may enjoy mimicking the voices of Spongebob and Mr. Krabs, as well as the story's nature of pure silliness. This book is also perfect to read throughout the month of December for the Christmas holiday season. Additional Christmas books featuring Spongebob Squarepants are A Very Krusty Christmas (2006), Spongebob's Christmas Wish (2003), and A Christmas Coral (2001). Click on any of the pictures below to view each Spongebob Squarepants product in more detail on Amazon.com.